BOSTON SOCIALISM: Sat, 4/7, Boston, "Justice for Trayvon Martin! March against racism!" 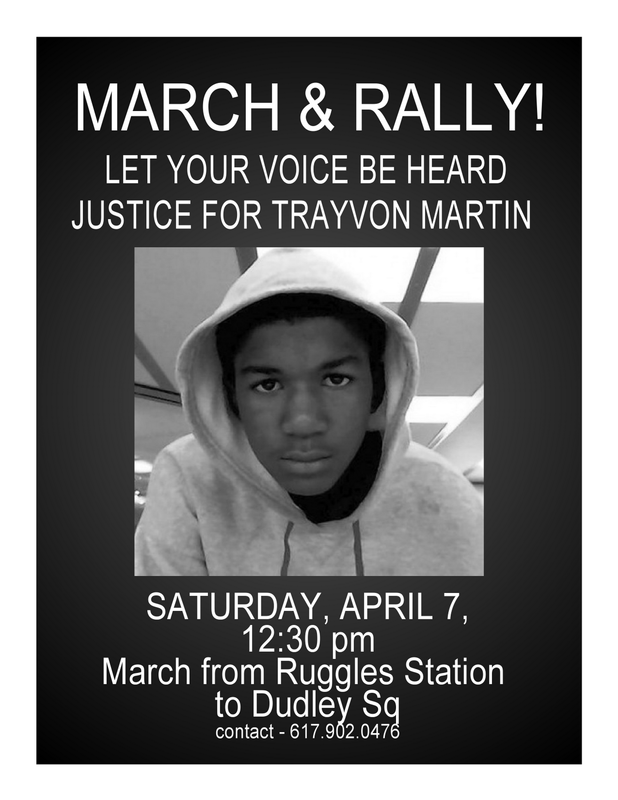 Sat, 4/7, Boston, "Justice for Trayvon Martin! March against racism!" On February 26, 2012, Trayvon Martin was shot dead by George Zimmerman, the self-appointed head of a neighborhood watch program in a gated community in Sanford, Florida. The 911 calls reveal that Zimmerman was racially profiling Trayvon--he told the dispatcher that, “This guy looks like he’s up to no good, or he’s on drugs or something.” Before he shot him, Zimmerman made sure to say that Trayvon "looks black". Trayvon is dead today because he was a young black man walking where someone thought he shouldn't be. His death proves that racism in America is alive and well. Trayvon Martin’s death is not an isolated event. This is the daily reality for what it means to be black in America. From the hundreds of thousands of Black and Brown incarcerated, to the millions who are denied the right to the equal education, affordable housing, quality healthcare and other social services, and to those who suffer the daily insults of racist bigotry---people have had enough! His brutal murder, like that of Emmett Till a generation before, has become a rallying point for millions fed up with a racist society. It has motivated people to turn anger and outrage into protest and come out in the streets and demand justice not only for his murder but against all the aspects of racism in this society that caused his tragic death. On April 7, people will be marching in Sanford and Washington, DC. And in Boston, we will be marching too. We will be marching from RUGGLES to DUDLEY, ending in front of the Police Station, with a speak out near the old B2 barracks grounds.